Always fasten items being carried as securely as possible using cargo tie-down rings and fastening materials appropriate for the weight and size of the load. The handling characteristics of a laden vehicle are dependent on the distribution of the load within the vehicle. 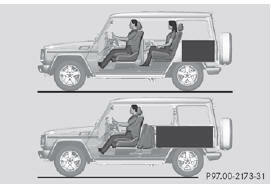 You should therefore load your vehicle as shown in the illustrations. The gross load limit and the gross vehicle weight rating (GVWR) for your vehicle must never be exceeded. The gross load limit and the GVWR are specified on the vehicle identification plate on the B-pillar of the driver's door . The load must also be distributed so that the weight on each axle never exceeds the gross axle weight rating (GAWR) for the front and rear axles. The specifications for GVWR and GAWR are on the vehicle identification plate on the B-pillar of the driver's door . Further information can be found in the "Loading the vehicle" section . • position heavy loads as far forwards as possible and as low down in the cargo compartment as possible. Transport loads when possible in the cargo compartment. You should only use the cargo compartment enlargement if the load does not fit in the cargo compartment. 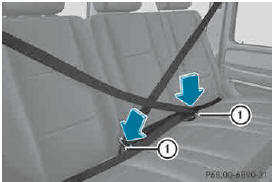 R always place the load against the front or rear seat backrests. If the rear bench seat is not occupied: ► Insert the belt tongue on the outer seat belts into the buckle of opposite seat belt 1. ► Secure the load with sufficiently strong and wear-resistant tie downs. ► Pad sharp edges for protection.